Karima Mansour stands out as the preeminent contemporary dancer and choreographer in Egypt today. Having completed a Professional Formation dance course in Italy, followed by obtaining a BA and Master’s degree in dance at the London Contemporary Dance School, she returned to Egypt and easily laid claim to Egypt’s contemporary dance throne. 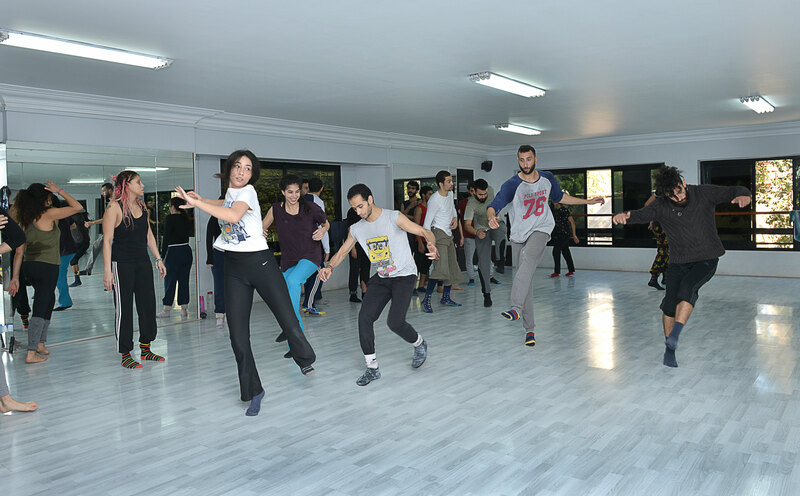 Today, the Cairo Contemporary Dance Centre, which she founded in 2012, is the sanctuary for Egypt’s steadily growing number of contemporary dancers. eniGma’s Mariam Nowar sat down with Mansour to find out more about her remarkable artistic journey and what she has in store for the future of dance in Egypt. I could feel a wave of excitement as I stepped into the Cairo Contemporary Dance Centre (CCDC) in Mohandessin to interview its founder, Karima Mansour. The music was blasting and a dance lesson was in full swing led by visiting US dance teacher, Frey Faust. The energy reverberating throughout was overwhelming, giving me the feeling of being in the presence of something truly magical. While Mansour had dreamed of studying dance after finishing high school, there were no opportunities in Egypt at the time. She decided to join the High Institute of Cinema since studying film seemed the closest to her passion. “But I really wanted to be studying dance not film!” she exclaims. Once she got her degree in film, she immediately set off to follow her dream. Mansour started MAAT, Cairo’s first independent Contemporary Dance Company (where she was the sole member), alongside joining the faculty of the Ballet Institute as Assistant Professor, taking charge of training the modern dance company at the Cairo Opera House and also teaching as adjunct professor for the PVA department at AUC in 2010. “Even though the company was just me, I worked under MAAT for years before launching CCDC in 2012,” she explains. During those years, Mansour choreographed over 20 pieces that have been performed in several European and Arab countries, and at the Kennedy Center in Washington DC. “The process of creating a dance inside your head and seeing it become a reality is beautiful,” she adds. CCDC offers a rigorous three-year program for full time students, as well as a variety of classes to the general public. Mansour believes that her students should be exposed to as many relevant skills and genres as possible. That’s why, besides contemporary dance, the formal curriculum includes classes in Ballet, Jazz, Hip-Hop, all the way to Gong Fu, Anatomy, and Acting. Adding to its credibility, the CCDC is accredited by the UNESCO Dance Council. “For the first time ever, we have homegrown dance artists from Egypt who needn’t pack up and leave the country to pursue their dreams,” she adds. Looking to the future, Mansour is excited about her next big step that will further enrich the contemporary dance scene. In May, CCDC will be launching a contemporary dance company, with graduates of the centre’s full-time program as its primary members. Mansour will be inviting guest artists to create pieces alongside her choreographies, and they will be performing at the Falaki Theater in downtown Cairo. This is exciting news not only for Egypt’s contemporary dancers, but for all the audiences who look forward to this important addition to Egypt’s cultural and artistic scene. Thanks largely to Mansour’s passion and dedication, the future of contemporary dance in Egypt seems to be getting brighter and brighter.